Two West Elm directors reveal what they look for in choosing a brand partner and share examples of successful collaborations. In today's competitive environment, brands seem to have fewer friends than foes. Companies are constantly fighting for consumers' attention and may find themselves pitted against organizations they didn't consider direct competitors in the past. But that doesn't mean that brands can't ever play on the same team. On the contrary, Ella Tay, director of brand marketing and partnerships for modern furniture and home decor brand West Elm, says brand partnerships can actually help marketers amplify their awareness and marketing efforts, as well as scale their reach. 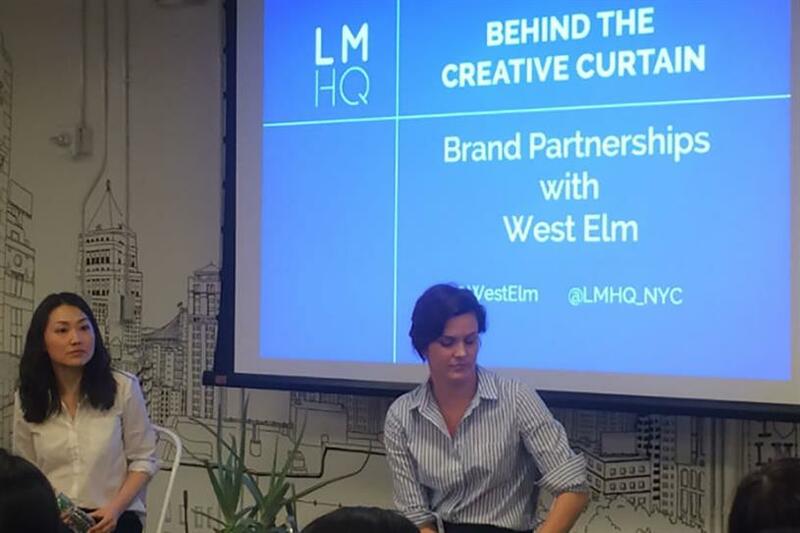 "I think brand partnerships are a way to draw in a different crowd," she said during a "Behind the Creative Curtain" session held by LMHQ, a nonprofit collaboration space for creatives in lower Manhattan. Tay would know. West Elm has partnered with a slew of companies—both big and small. In 2013, it launched West Elm LOCAL—a program in which the brand works with local businesses to sell their products in its regional stores and online. It's also partnered with large nonprofits and B2C brands, including St. Jude Children's Research Hospital, Airbnb, Sherwin-Williams and Whole Foods Market. Of course, as in any relationship, not every partnership is perfect. To help other brands find their right partner, she spoke with director of business development for West Elm LOCAL Mo Mullen and shared their three "gut check" principles for finding a successful fit. 1. Does the partnership generate excitement? If marketers want customers be excited about a brand partnership, then they need to be excited about it themselves. "Is the partnership inherently exciting to you?" Tay asked the audience at LMHQ. "It has to be something that makes you go ‘Oooh. That's pretty cool.'" Tay recommended finding a partner that can help both companies create new, exclusive and unique brand experiences. She also said that it's important to find partners who are relatable, recognizable and reputable, as well as easily understood and accessible to customers. Take West Elm's partnership with mattress e-tailer Casper, for instance. Casper is an e-commerce company that sells mattresses online. And while Tay said the online business model helps the company be a disruptor in the space, she also said that it prevents customers from trying mattresses before they buy them. When West Elm and Casper partnered up, they decided to host more than 80 Casper showrooms in West Elm stores. Not only did this give Casper customers the opportunity to experience the mattresses firsthand, but it also allowed West Elm to offers its customers something exclusive. "I think the store managers found it very additive and exciting for them," Tay said. 2. Are there opportunities for customization? Not every partner is going to have the same objectives and resources. That's why Tay said it's important for marketers to discuss both companies' goals, needs and limitations, and then assess whether they can benefit from working together. "Is everybody pretty mutually happy?" she asked. She explained how West Elm did this when partnering with community accommodation marketplace Airbnb. Airbnb wanted to find a way to help inactive hosts publish their first listing, she explained. So, West Elm hosted events in select stores in which Airbnb users could come in and receive design advice from West Elm's home stylists. If inactive Airbnb users ended up activating a new listing, they were eligible to receive a $50 West Elm gift card. And if they were able to book their first guest, they were eligible to receive a $150 West Elm gift card. West Elm and Airbnb also promoted the initiative via email. To truly deliver customizable solutions, Tay recommended working with professionals beyond the marketing department, such as those in design, IT, or inventory. "Different brand partnerships require different resources," she said. Mullen also advised the audience to be flexible when it comes to brand partnerships. She knows, for example, that West Elm's LOCAL vendors are businesses of all sizes. Some vendors may be selling their products as a hobby while others are hoping to expand nationally. As a result, Mullen can't treat all of these vendors the same way and she has to meet them where they are. "Being able to be customized and have that sort of flexibility with each relationship has been huge in building a long-term partnership," she said. 3. Is the relationship authentic? Authenticity can mean different things to different marketers. For Tay, authentic brand partnerships are the ones where both companies have truthful conversations, listen to one another and share insights. "I think it's a commitment to sticking it out," she said. Granted, these relationships aren't formed overnight. Consider West Elm's relationship with Whole Foods Market, for instance. Tay said that West Elm started talking with Whole Foods Market in 2014; however, the two brands didn't launch a collaboration until 2016. She described that two-year gap as a time of "exploration"—one filled with brainstorming sessions, mock-ups and marketing decks. However, it seems like the persistence paid off. The two companies found a common value in their focus on sustainability, and they decided to launch an upcycled denim collection of kitchen and tabletop items. Customers of the brands could visit a special landing page on West Elm's website to find recipes and entertaining ideas. For every person who made a recipe and shared a photo of it on social media with the hashtag #WestElmWFM, West Elm donated $1 to the Whole Planet Foundation. The brands also hosted events in select West Elm stores where customers could learn more entertaining and cooking tips. "The best of the best partnerships are complicated," Tay said. Authenticity also requires considering partners' pain points. For example, Mullen said that many small businesses find it difficult to partner with large retailers because their brand stories aren't told well. West Elm has tried to address this problem by telling stories about its local makers, such as through its signage, product pages and video content. "We really try to [tell their stories] across all channels," Mullen said. Of course, part of forming authentic partnerships is knowing when one isn't a good fit. Tay said that West Elm had been trying to partner with J. Crew for a while. But when it became apparent that the fashion retailer was more interested in paper goods, they decided to not work together. As in any relationship, the chemistry can't be forced and marketers are better off waiting until the right one comes along. This story first appeared in DMN.